Hello guys in this post of Zainhosting.com we are going to discuss about the best and top web hosting company in Karachi city of Pakistan named Omni Link and the website is Omnilinks.net. We will discuss here about their prices support level, payment methods, address and other factors of those web hosting and domain Registration Company. We hope you will like this post and you will get the reliable information about hosts from Karachi Sindh Pakistan. Omni Links is a good company of domain registration and host from the Karachi city; they are providing domains, web hosting, reseller, VPS and dedicated servers etc. They are providing .com domain name in just $10 USD per year as well as you can get the Dot Net domain name also in $10 but the .info domain prices are high on their website, which is available in $12 USD for one year. Dot US and XYZ domain prices are also high on their site, they are providing dot us domain in dollar 11 USD and dot xyz domain name in $16 USD. They are also providing web development, G Suite (Google email service), SSL certificates, branded SMS service, whmcs services, SEO and social media marketing also. 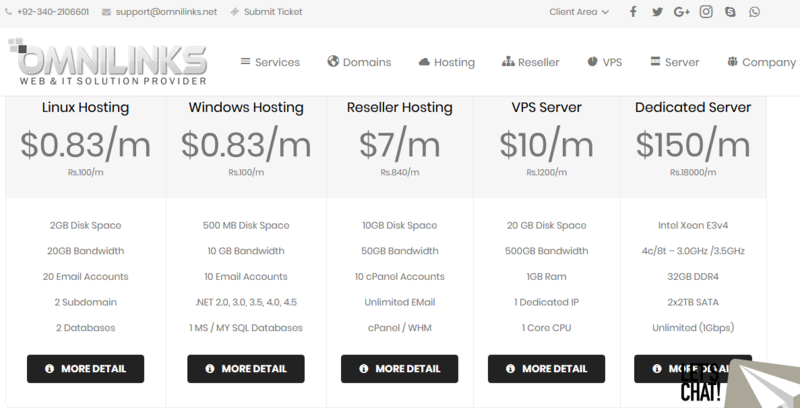 Omni Links is providing Linux web hosting in just $0.83 USD per month and in this package they are providing 2GB disk space, 20 GB bandwidth, 20 email addresses, 2 subdomains and 2 databases. You can get windows web hosting package in the same price of $0.83 per month but in this package you will get 500 MB disk space, 10 GB bandwidth, 10 email accounts and 1 mySQL database. Now I am going to tell you about Omni Links reseller host packages and plans, there reseller web hosting price is very low you can get a reseller package in just $7 USD per month and in this reseller package you will get 10 GB disk space, 50 GB bandwidth, 10 Cpanel accounts, unlimited email addresses, Cpanel and web host manager (WHM). Omni Links is also providing VPS service in cheap prices like they are offering 20gb disk space VPS with 500 GB bandwidth, 1GB RAM, dedicated IP address, in just $10 per month only. There dedicated server prices are little bit high there minimum dedicated server package’s price is $150 per month and in this dedicated server you will get Intel Xeon E3V4, with 32GB ddr4 Ram and 2x2TB Sata disk. Payment Methods: They are accepting bank transfer and you can pay them through Standard Chartered Bank or Meezan Bank, omni links is also accepting easypaisa and Jazz cash payments, they are also accepting E-bank accounts payments like skrill and payza etc, so if you want to buy a web hosting or domain name from omnilinks then you can easily pay them without any hesitation or problem because they have wide range of payment methods. Office address: The office of Omni Links (Omnilinks.net) is situated at Jamia Millia road Malir City Karachi, Sindh, Pakistan. Contact / Support: You can contact them through phone call by this mobile number, +92-340-2106601, or you can contact them through the live chat option or you can send an email on this email address > support@omnilinks.com. Thank you for visiting ZainHosting.com and we hope you will like this post and you have got the all information about this web hosting provider company from Karachi ‘OmniLinks’. If you are the customer of this company then you can share your experiences and reviews below through comments.